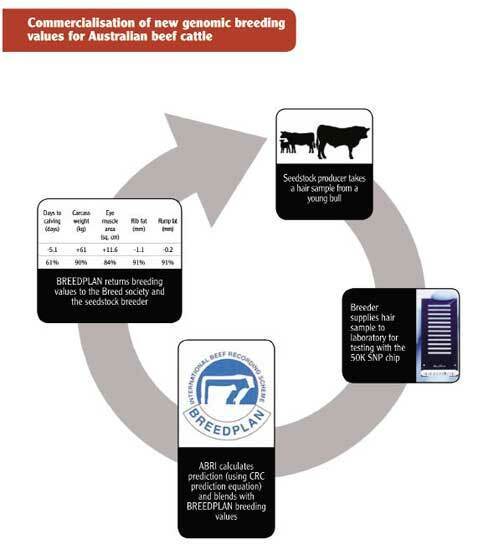 A new project launched by the Beef CRC and MLA to kick-start the commercial rollout of the Beef CRC's genomic predictions for Australian beef cattle has been oversubscribed by breeders seeking to participate. Beef CRC CEO Dr Heather Burrow said the number of subscribers to the 3000 young animal project reflected growing confidence in the industry in the value of genomics to predict commercially important traits. "With the genomic prediction equations developed from the new 700K SNP chips, we will deliver a world-first product to identify the genetic qualities for hard-to-measure production and reproduction traits across breeds," Dr Burrow said. The owners of the 3000 animals will be the first in Australia to receive the new Australian blended genomic breeding values for their animals. The project invited beef breed societies and breeders to participate in the genotyping of 3,000 young animals to predict their breeding value using the new genomic prediction equations. Around 110 breeders representing 11 different breeds applied to be part of the project, which was over-subscribed. The collection of samples for genotyping began in January 2012. Dr Hans Graser, Director of AGBU, who is coordinating the project through the Beef CRC, said the 3000 young animal project partially supported the cost of genotyping for breeders as part of the rollout of genomic predictions for Australian beef cattle. "The accuracy of these genomic predictions will vary across breeds and across traits," Dr Graser said. "We are still in the process of calibrating their accuracy for all BREEDPLAN traits. They will be tested using the industry sires which were genotyped in 2011." If shown to be robust, the predictions will help commercial bull-buyers to identify which bulls are most suited for their production systems with greater confidence. They will also improve the accuracy of all BREEDPLAN traits. MLA's Manager of R&D Strategy Dr Rob Banks said the key advantage for breeders was to gain a genetic insight into the qualities of young animals that do not have any performance data recorded. "You can't at present, for example, measure days to calving on a young bull but if you could use BREEDPLAN genomic data to predict days to calving with improved accuracy, that would really help in the decision making process for selecting the top animals," Dr Banks said. The accuracy of the new blended genomic breeding values, which include hard to measure traits such as carcase and meat quality, net feed intake and male and female reproductive performance in tropical cattle, were released by Beef CRC Chief Scientist Professor Mike Goddard at the Beef Australia 2012 International Beef Cattle Genetics Conference in Rockhampton. Dr Burrow said the value overall to the industry was to improve the accuracy of selecting the next generation of young sires. "Once the genomic predictions have been calibrated in BREEDPLAN, the technology will help Australian producers increase their rates with genetic gain," she said. "The critical thing is that this product has been developed and tested on Australian animals in Australian production systems." Dr Burrow said the inclusion of genomic information would continue to improve breeding accuracies with increased levels of performance recording in industry herds. "This is the path the Americans are taking and Australia has to do the same to keep the momentum going." Dr Burrow said delivering the genomic prediction equations was a key milestone of the third round of Commonwealth funding for Beef CRC. "By the time the CRC closes in June we will have met and, in some cases exceeded, all our funding milestones," she said.